Having received a large quantity of fabric from my sister, I needed to make room for storing this. Sorting through my current stash of fabric, I found a container of dyed fabrics that I had made when trying different dyeing techniques. These swatches were each 5″ x 5″. Many of my original dyeing samples were used in previous projects, such as described in “Fabric Dyeing” and “Spring has Sprung“. The ones left were a bit dull in color. No longer needing these, I decided to make another of the many quilts in my “Future Projects” folder on my computer. To brighten them up, I combined them with white fabric and use variegated thread for the quilting. It’s amazing how the white makes even drab fabrics look cheery. This was a simple pattern that combined these 250 different swatches in long rows separated by white sashing, turned on point and set in asymmetrically. I really like how it turned out. It’s April, the birds are singing outside my window, the bulbs are coming up in my gardens and the grass is starting to get green. So, it’s time to change the decor in my bedroom – a new Daisy Bed runner really added some springtime color. 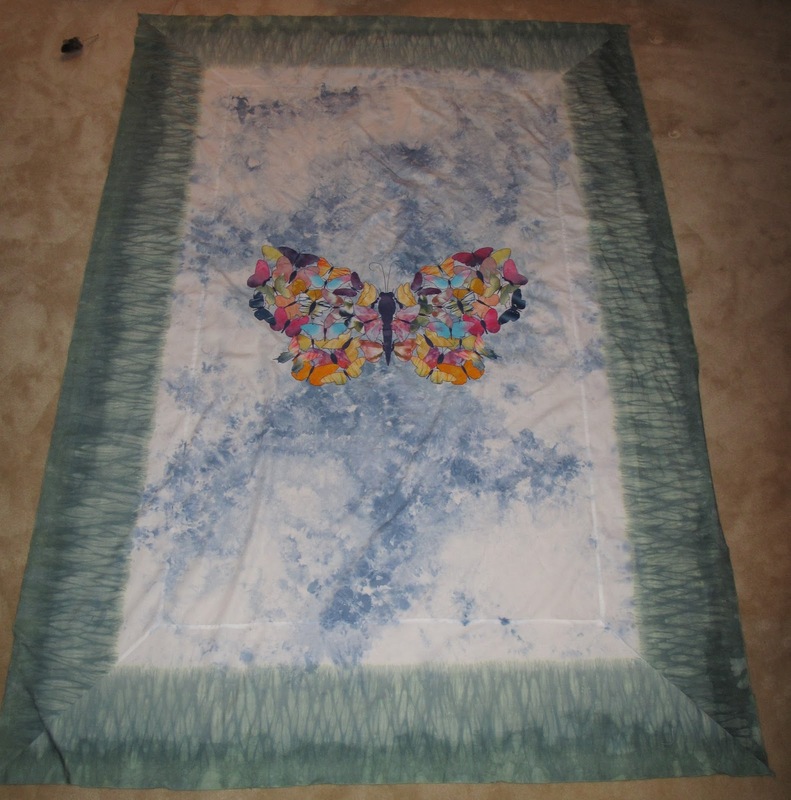 To make this bedrunner, I used the leftover blue fabric from the backing of my butterfly quilt as the main background. To supplement the blue, I took out some of my custom dyed fabric samples, generally ones that were trials on different dyeing techniques. For added color, I decided to try out some fabric paint crayons. A few years ago, I took a class on Shiva Paintsticks and Rubbing Plates. I enjoyed the class and purchased some supplies. However, time being in short supply, I really hadn’t used them since completing the class. This project, I thought would be a good use of the paintsticks to embellish the fabrics that I had in my collection. After a day of painting, I set the fabrics aside for a week to allow the oils in the dye crayons to dry. The dye pigment was then heat set by ironing the fabric between pieces of brown paper (absorbs the excess oils very nicely). The resulting fabrics were really interesting. Triangles were cut out of the fabrics and the border was then made by alternating triangles of blue and color. 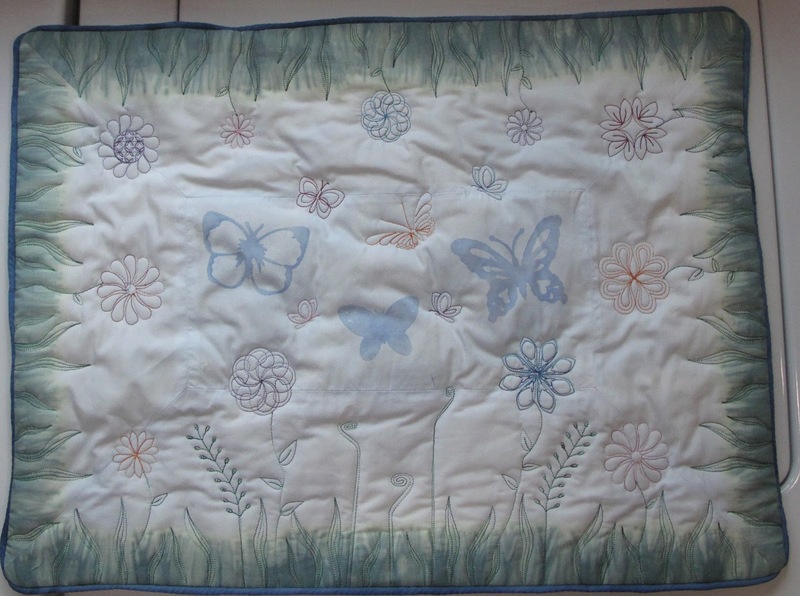 To enhance the bedrunner, daisies and leaves were appliqued onto the center panel. The runner was quilted and the binding added. 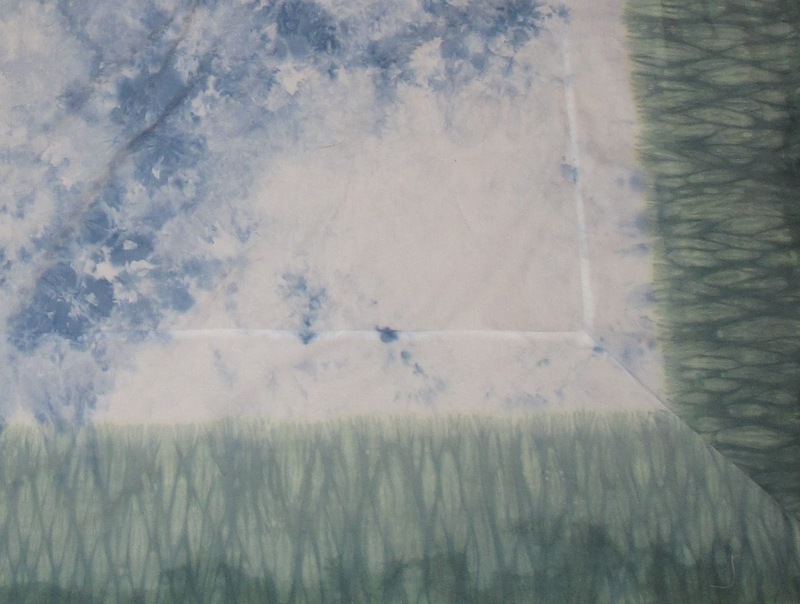 Arashi Shibori, pole wrapping, creates an interesting dye pattern in the fabric. Because I liked how my initial samples turned out (see April 13, 2016 and August 12, 2016 postings), I decided to do a small experiment. To assess the effect of the amount of compaction of the fabric has on the dye pattern, the following experiments were completed. I now have samples that I can refer to when planning to dye fabric using this technique. Can’t wait to try some more fabric dyeing. The Minnesota State Fair ended one week ago. Finished up just in time, I entered my butterfly quilt this year. A third place finish was a nice outcome considering that the Sweepstakes winner was the first place quilt in my category. Quilt and Pillows on our guest room bed. After submitting the quilt, I did have some time to make a pillow sham and decorative pillow. 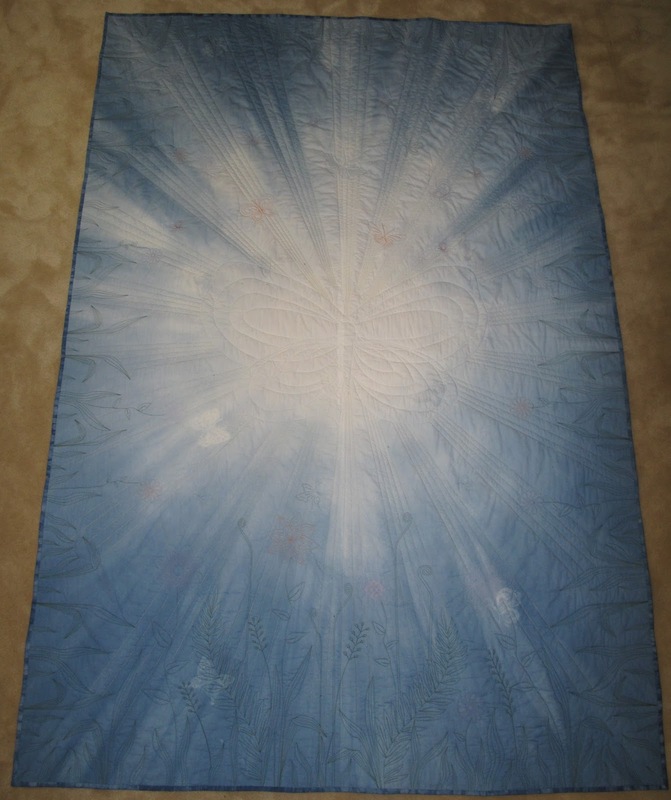 The sham was made with custom dyed fabric and thread painting similar to the quilt. For a decorative throw pillow, I did an on-line search for paper piecing butterflies and found a really nice site (https://lillyella.com/2015/09/02/butterfly-charm-block-paper-piecing-patterns/). 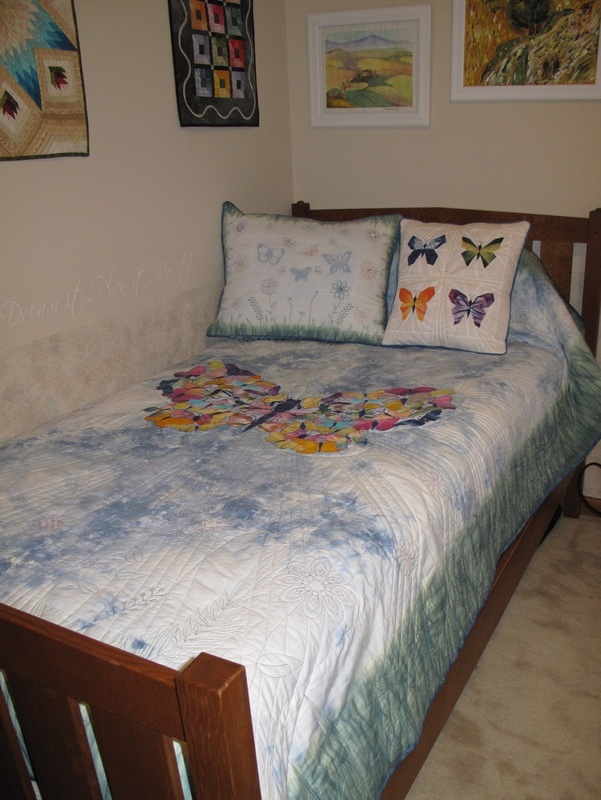 I really enjoyed using my dyed fabrics to make the butterflies for the pillow. My butterfly quilt is complete! From a distance, it is hard to see the details. But, close up it’s really fun to look at. 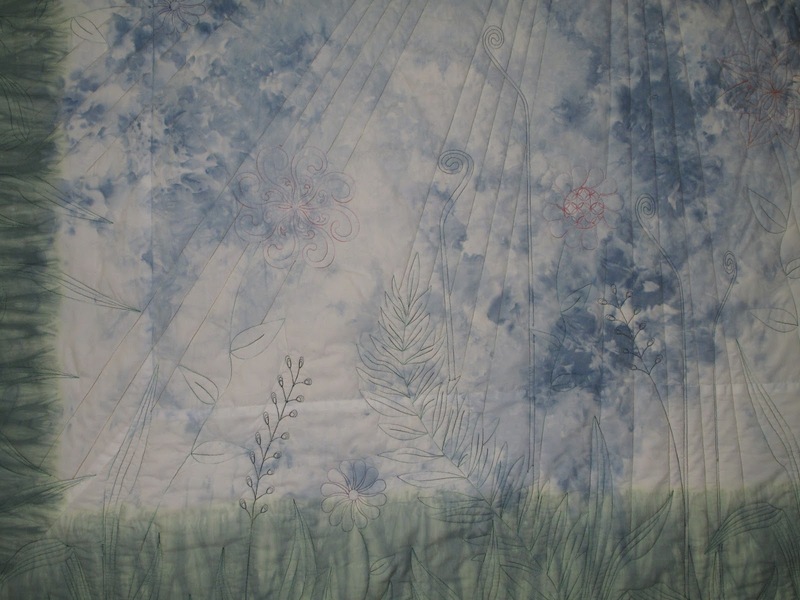 I find inspiration for my quilting from a variety of sources – photos, coloring books, . Sometimes the quilt block “suggests” the quilting design. Other times, it can be a bit illusive. 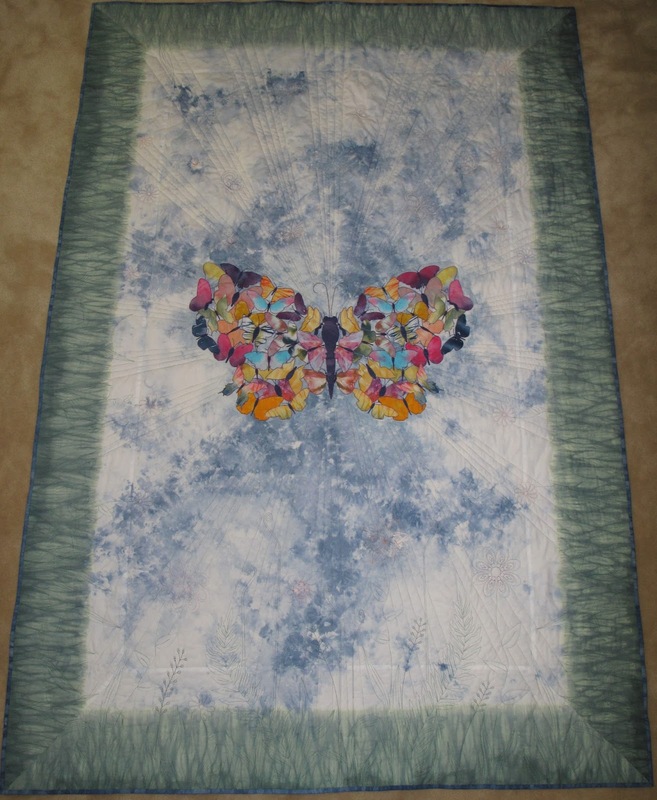 When planning this butterfly quilt, I knew I wanted the quilting along the edges to look like grass, but I also wanted to add some creativity to the border. 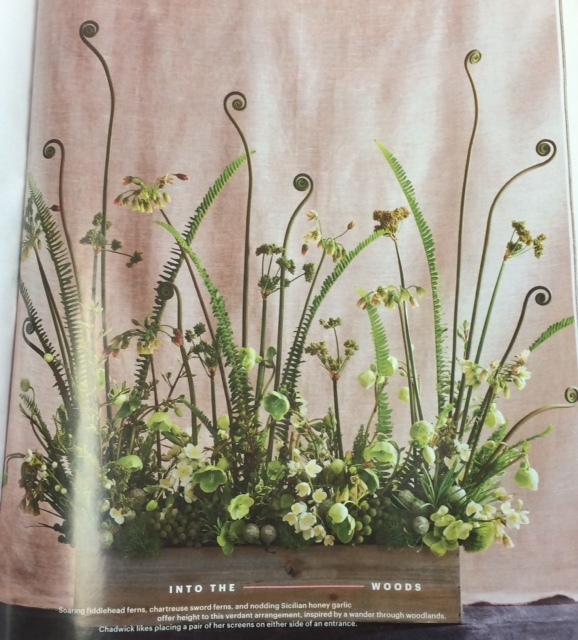 While at work, I found inspiration in a recent copy of Martha Stewart “Living” magazine. 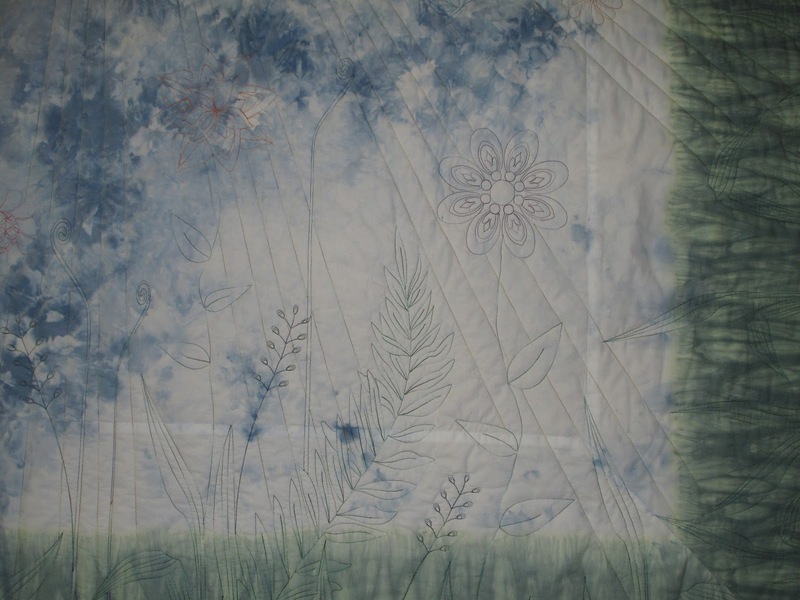 I liked the ferns and curly spikes in this photo and thought they would be a great addition to the quilting. I also wanted to add some flowers and butterflies flying in the background. The back is fun to look at as well! After my butterflies were all cut, it was time to create the background fabric that they will be appliqued onto. Inspiration – my garden (ie: grass and blue sky). 1. Cut 4 yards of Combed Cotton (Dharma Trading Company) lengthwise into three strips 144″ x 15″. 2. Sew each strip into a long tube (using a basting stitch) and scrunch onto 4″ x 24″ PVC pipe. 3. Place the fabric tube into wallpaper water tray that contains 750 ml Emerald Green Dye (2 mg/ml concentration) for 10 minutes. 4. Remove the fabric from the dye, place on paper towel to absorb excess dye solution, then wrap in plastic and batch for 4 hours. 5. Remove the stitching, rinse with cold water and wash with Blue Dawn. 1. Cut the green dyed fabric into two pieces 105″ in length and two pieces 75″ in length. 2. Sew these to the sides of a 72″ x 45″ piece of undyed Combed Cotton, making mitered corners. 3. Soak the fabric in warm water and wring out excess so that the fabric is just damp, not dripping. 4. Scrunch the undyed center fabric into a drain tray (sorry, but I didn’t take pictures of this), with the green edges hanging over this sides of the tray to keep from getting too much blue dye on the “green grass”. Place a 12′ x 15′ piece of scrap fabric over the scrunched fabric to catch any undissolved dye particles. 5. Cover the fabric with ice cubes. I used eight trays of ice, which made the layer about 3″ thick. 6. Sprinkle with 0.5 gm Mixing Blue and 1.5 gm Royal Blue dye powder. 7. Place the drain tray in a large plastic bucket to collect the melting ice and cover (to keep my cat out of the dye). 8. After the ice has melted (about 8 hours), pour one liter of hot Soda Ash solution over the fabric to set the dye and allow to batch for one hour. 9. Rinse out the excess dye with cold water and wash with Blue Dawn. 10. 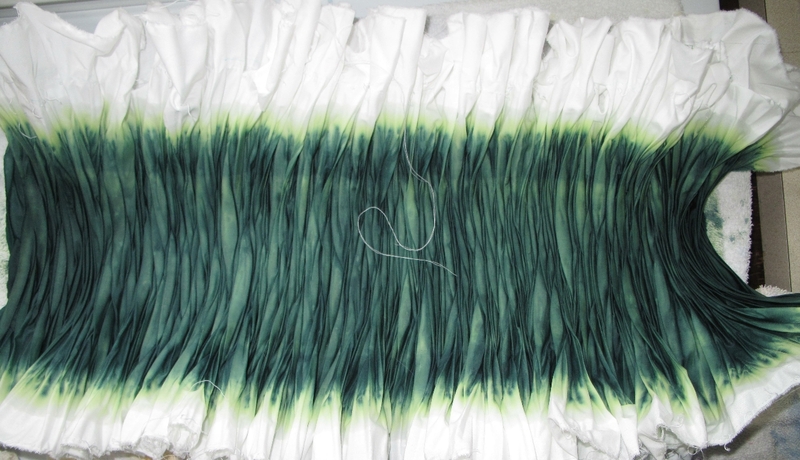 After drying, scrunch the edges of the fabric together and dip in Evergreen dye (1 liter of 2 mg/ml) to create a darker green edge. 11. Batch for four hours, rinse and wash. 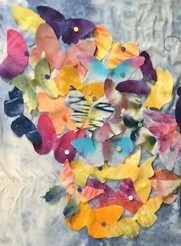 The background fabric was now ready to applique the butterflies. I used a variagated silk thread for the applique (Tiara #705 Silk, Superior Threads). For my backing fabric, I wanted to complement the quilting that I was planning for the top of the quilt. To do this, I thought I would try to ombre dye the fabric. As an added detail, I decided to first use dye magnet and dye blocker to make some butterflies that would appear in the dye. 2. Cut butterfly stencils out of adhesive vinyl using my Cameo stencil cutter. 3. Paint dye magnet near the center of the fabric to create five butterflies that will be darker than the dyed background color in those areas. 4. Paint dye blocker (Nori Glue) in the outer part of the fabric to create five butterflies that will be white the the darker areas of the fabric. Allow both magnet and blocker to dry completely overnight. 5. Pull the center of the fabric together and secure to a wooden pole, similar to that described for ombre dyed sheers. 6. Fill a 4 gallon bucket with 8 liters of hot soda ash solution. 7. 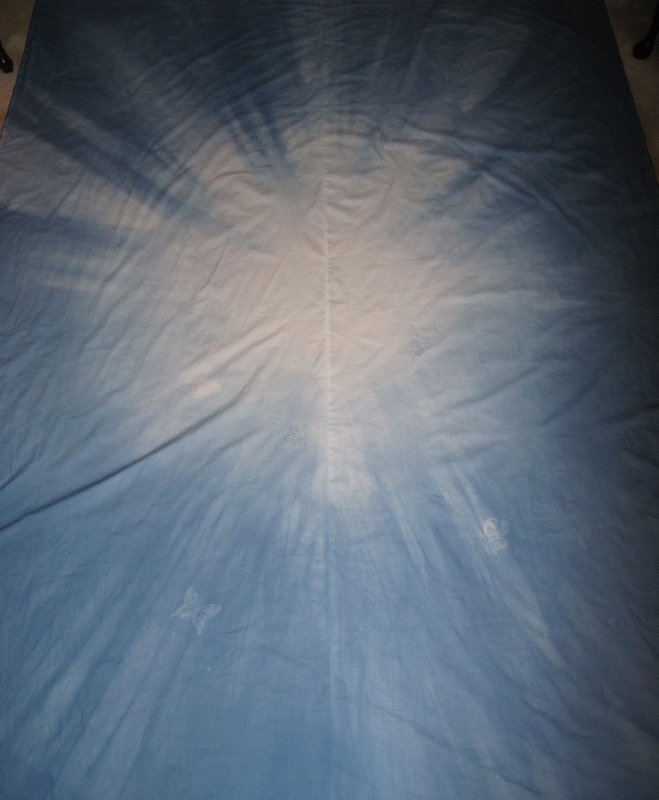 Add 1ml dye solution (200mg concentrate) and dip fabric to about 4″ from center fabric attached to pole. 8. Remove fabric, add more dye concentrate and dip the fabric again but this time stopping 4″ less than previously dipped. Repeat this process stopping 4″ shorter each time. Dye concentrate amounts used were 1,1,2,2,5,5,8,8,10,10,20,20 ml of 200 mg/ml solution. 9. Allow to hang and batch, with excess dye dripping off, for two hours. 10. Dip fabric in 4 liters of dilute Retayne and hang again for 20 minutes to allow the dye to set to the fabric. 11. Rinse out excess dye with cold water and wash with Blue Dawn. I am now ready to load this quilt onto my longarm machine and start the custom quilting process. As a pediatric dentist, I see lots of kids with interesting clothing selections. Some have mismatched colors, some have their shirts on backwards (or their shoes), but some are absolutely adorable. Last winter, one of my younger patients (she was a little over 3 years old) came in with a t-shirt on that had a large butterfly printed on it. Now, I love butterflies – with their beautiful colors and graceful wings. This little girl was fearful of having me check her teeth, so I tried to help her relax by talking to her about her t-shirt. Turned out that she liked butterflies too and gladly started showing me her t-shirt. On closer inspection, this large butterfly was actually made up of smaller butterflies and was really cute. After a successful dental checkup, she left cavity free and happy! Since it was a busy day, I didn’t think more about the patient until my lunch break when my staff commented that they were happy she overcame her fears and was able to complete an exam and cleaning. One of my staff commented that the conversation about the butterflies may have been what helped her to relax. 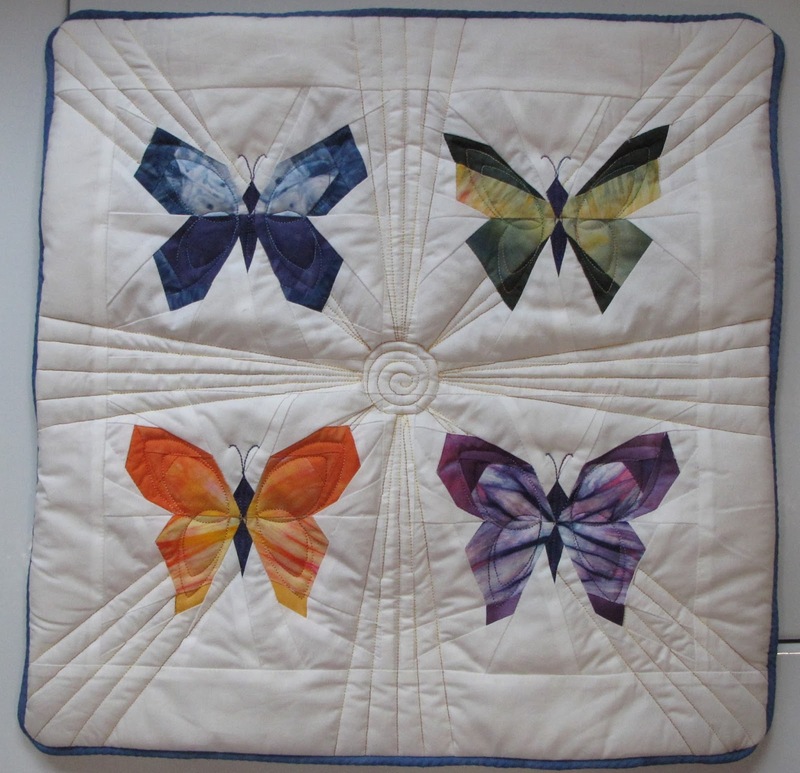 This conversation sparked an idea in my mind – to make a quilt with a butterfly made out of little butterflies. An on-line image search was unsuccessful in finding a picture of the t-shirt that matched what I remembered seeing earlier that day. I did, however, find a link to the Missoula Insectarium. 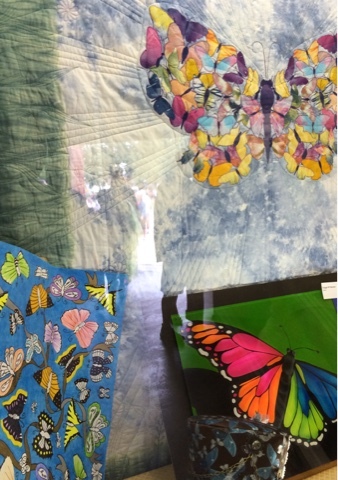 In their store, they sell a t-shirt with butterflies that I thought might be a good inspiration for my quilt. Using a graphics program, I did a quick design to see how the idea might look. This, I thought, was going to be a fun quilt to make. Using the graphics program, I cropped the butterfly image around each of individual butterflies. In doing this, I found that several of the butterflies were about the same shape. So, I actually only had 12 different butterflies to work with. 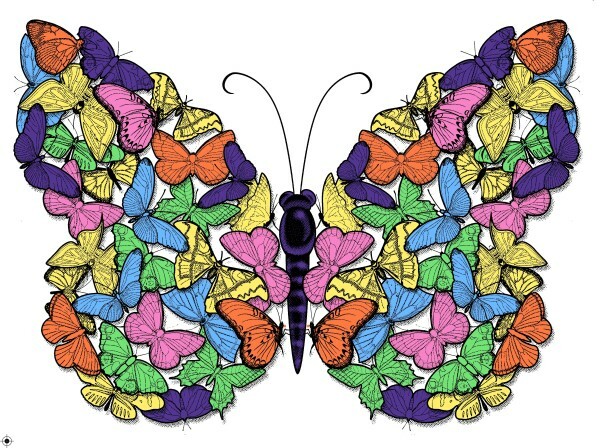 Using the Bernina DesignWorks software, I created a Cutwork and Applique file for each butterfly. 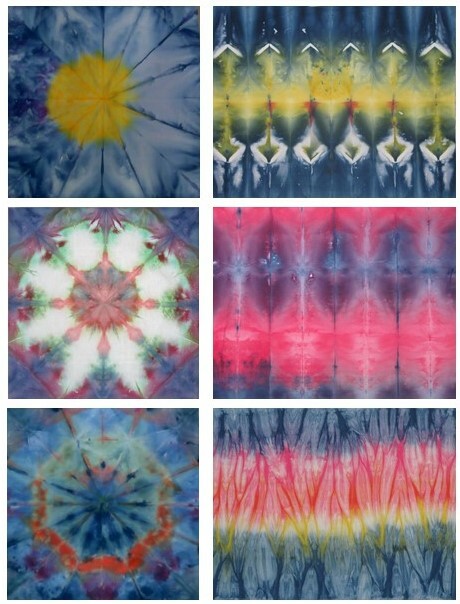 For my fabrics, I used the samples from my many trials of fabric dyeing – shibori, mandala, etc). 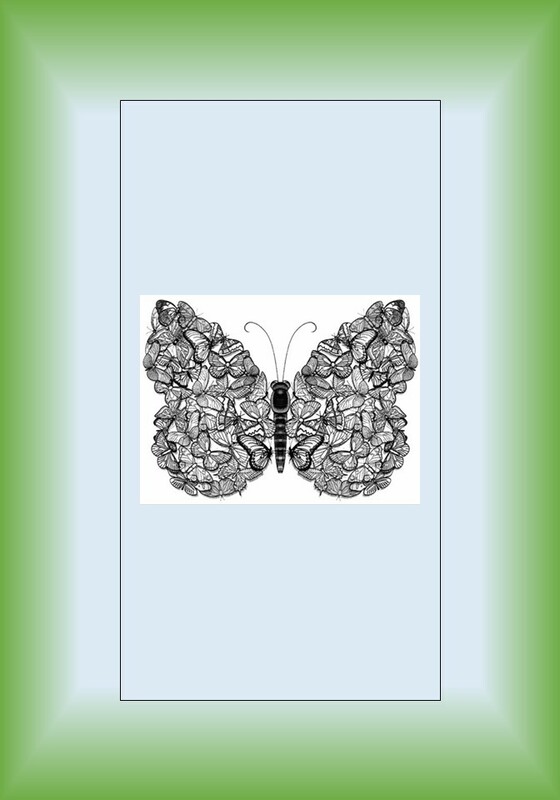 These fabrics had symmetrical colorings and patterns that worked well for butterfly wings.